The Sunset at Cape Sounion are truly magical. Twice I had the good fortune to be there. The site is ancient and the temple ruins are evocative. The earliest literary reference to Sounion is in Homer’s Odyssey . The story recounts that as the various Greek commanders sailed back from Troy, the helmsman of the ship of King Menelaus of Sparta died at his post. His shipmates cremate his remains on the beach at Cape Sounion. 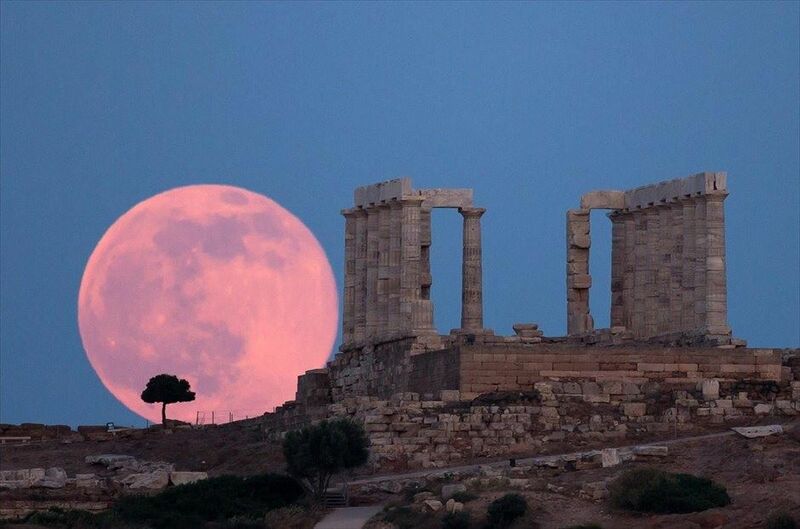 The temple of Poseidon at Sounion was constructed in 444–440 BC. This was during the ascendancy of the Athenian statesman Pericles, who also rebuilt the Parthenon in Athens. It was built on the ruins of a temple dating from the Archaic period. It is perched above the sea at a height of almost 60 metres (200 ft). The design of the temple is a typical hexastyle, i.e., it had a front portico with six columns. The temple is located about 45 minutes outside of Athens on the Southern most tip of Attica and facing the Aegean Sea. As I count down for my birthday on Friday, I am looking at old photos of myself and places visited or lived in. 1959 in the family living room when Television sets were actual furniture broadcasting only 4 channels. The twins of Argos, Kleobis and Biton in the Museum of Delphi in Greece, sculpted by Polymedes c. 500 B.C. They are twice a human size, presented here as divinities. Here I am enjoying a Greek beer in Delphi just minutes away from the village of Arachova where we were staying. We were celebrating our Anniversary and friends suggested we visit the area. A view of part of the Gardens of the Villa Borghese in Rome in Spring 2009, always a pleasure to walk in at any time of the year. From the Rijks Museum in Amsterdam a beautiful nature morte painting, Flemish school. What I find truly fascinating is how the painter was able to reproduce all the elements, the citrus, the chinese bowl, the silver pitcher and gold goblet and intricate details. We visited in 2008. Café Metropol, Athens, in front of the Cathedral of Athens, a great place for a coffee and a light meal. In Rome with my new Borsalino which I purchased in Milan. I found out on a trip to Sicily that this is the type of hat the Capo of a Mafia clan would wear. This explains the puzzled looks I got in Agrigento from local men. The Giusti Palace and Garden (Italian: Palazzo e giardino Giusti) are located in the east of Verona, Italy, a short distance from Piazza Isolo and near the city centre. The palace was built in the sixteenth century. The garden were planted in 1580 and are considered one of the finest examples of an Italian garden in Europe, a splendid park of terraces climbing upon the hill. The caryatids of the erechteion on the Acropolis in Athens are famous due to their great age but also for what seems like eternal presence on this spot. What you see today is not the original but faithful copies. The originals are in the New Acropolis Museum where now you can walk all around them and admire their beauty and intricate hairstyle, each different from the other. They inspired an architectural style found in many buildings. One is missing as it was stolen by the infamous bounty hunter Lord Elgin and sold for a pittance to the British Museum. If you look at them standing up high on this portico it is difficult to appreciate them for their beauty. However by going to the New Acropolis Museum you can walk around them and see at eye level how well preserved the original caryatides are despite being 2400 years old. The Erechtheion (or Erechtheum) is an ancient Greek temple constructed on the acropolis of Athens between 421 and 406 BCE in the Golden Age of the city in order to house the ancient wooden cult statue of Athena and generally glorify the great city at the height of its power and influence. The Erechtheion has suffered a troubled history of misuse and neglect, but with its prominent position above the city and porch of six Caryatids, it remains one of the most distinctive buildings from antiquity. The project to replace the damaged buildings of the acropolis following the Persian attack on the city in 480 BCE was begun in 447 BCE, instigated by Pericles, supervised by Pheidias. The results would include the Parthenon and new Propylaea on the Acropolis itself and an Odeion and the Temple of Hephaistos. The final piece to complete the magnificent complex of temples on the acropolis was the Erechtheion, begun in 421 BCE. However, the project was interrupted by resumption of hostilities between Athens and Sparta and the temple was not finally completed until 406 BCE under the supervision of the architect Philocles. The Erechtheion, named after the demi-god Erechtheus, the mythical Athenian king, was conceived as a suitable structure to house the ancient wooden cult statue of Athena, which maintained its religious significance despite the arrival of the gigantic statue within the nearby Parthenon. The building also had other functions, though, notably as the shrine centre for other more ancient cults: to Erechtheus, his brother Boutes – the Ploughman, Pandrosos, the mythical first Athenian king Kekrops (or Cecrops) – half-man, half-snake, and the gods Hephaistos and Poseidon. The sacred serpent (oikouros ophis), which was believed to be an incarnation of Erechtheus, dwelt in one of the western chambers and acted as guardian to the city. Well looked after, it was regularly fed with honey cakes. As with the other new buildings on the acropolis, the Erechtheion was built from Pentelic marble which came from the nearby Mt. Pentelicus and was celebrated for its pure white appearance and fine grain. It also contains traces of iron which over time have oxidised, giving the marble a soft honey colour, a quality particularly evident at sunrise and sunset. The whole building was originally surrounded by a 63 cm high Ionic frieze, but this has been so badly damaged that it has been impossible to determine even the general theme of the piece. What is known is that it was carved from Paros marble and attached to a dark blue (or grey) background of Eleusinian marble. Pediment roofs of wood and tiles protected the cella and north porch, while the south Caryatid porch had a flat roof. To the south-west of the building stood the sacred olive tree, a gift from Athena, for which she became the patron deity of the city. The tree can still be seen today and it is quite beautiful though not original. The real stars of the Erechtheion are without doubt the Caryatids or korai as they were known to the ancient Greeks. The finely-sculptured figures are not unique to the building as other examples exist in the architecture of the Archaic period, particularly in Treasury buildings at sacred sites such as Delphi and Olympia. Their clinging Doric clothes (peplos and himation) and intricately plaited hair are rendered in fine detail. Their bold stance and the firm set of the straight standing leg give the impression that the task of bearing the weight of the porch entablature and roof is effortless. Rather cleverly, the straight leg also creates folds in their clothing remarkably similar to the flutes on an ordinary Ionic column. Originally, the figures raised slightly their robe with one hand and held shallow libation vessels (phialai) with the other. This may have been in reference to the fact that it was believed that the tomb of the mythical King Kekrops lay under the building, and perhaps the libations poured by the Caryatids replicate the practice of pouring libations into the ground as an offering to the dead. The Caryatids now on the acropolis are exact copies; five of the originals reside in the Acropolis Museum of Athens and the other is in the British Museum, London. Some sayings are repeated ad nauseam to the point where no one really knows what it actually means. One such saying is ” Those who cannot remember the past are condemned to repeat it”. In other words learn from the past and avoid mistakes in the future. Who said this first, I have no idea and frankly I dislike this saying profoundly simply because it is trite and totally untrue. In today’s world not only we do not know our history (the past) or any history or past event for that matter but we are repeating the same mistakes over and over again, all the while saying Those who cannot remember the past are blah blah blah. In Canada we do not learn from the mistakes of our predecessors if current political events are a guide. During this National Electoral Campaign period the longest since 1892 many issues have come up all important and indicative of the problems beseeching Canada today. One particularly emotional event was the photo of the little drowned child Alan Kurdi dead on a beach in Turkey. The story was of fleeing families from the four year old Civil War in Syria. So far 11 million Syrians of all confessions have fled, those who remain live in fear amongst the ruins, half a million are dead. The family of this child, some of whom are living in Canada claimed that the Canadian Government had failed to accept them within its refugee program for resettlement. It should be said at this point that as a former Immigration Officer of the Canadian Foreign Service the issues of refugees and people seeking resettlement is well known to me. For many years I worked in Northern Africa and the Middle East and am well acquainted with the movement of population and the work of the United Nation High Commissioner for Refugees (UNHCR). Refugee questions are governed by well established rules and procedures in Conventions written in part by Canada as a founding member of the UNHCR and the UN after the Second World War. While I was on my last post and working in Athens I often met with Syrians who had been in Greece under difficult circumstances in some cases for 20 years. The Greek authorities considered them simply as transient and did not have to do anything to help them under the UN Refugee Conventions. Turkey created its own problems for anyone arriving on its territory and trying to claim refugee status. Turkey is a land bridge to Europe and the transit of thousands of people through its territory is problematic. Coupled with that the well established criminal gangs which procure passports and other documents in exchange for large sums of money to anyone who can pay. The same gangs are also involved in transporting people to other European destination like Italy. This traffic is well established, profitable and brings large profits in the millions to such criminals who exploit the poor and those who have no were to turn. This traffic victimize people who are feeling for their lives in this case the Syrians. Governments are very well aware of this situation and it is very well documented, including the routes taken and who is involved. Sometimes a crackdown will happen and some corrupt Government Official will be arrested, but that is rare. The people travelling can be separated into two groups, the first are young men under 25 years of age who are economic migrants, they seek to find work in a Western country so they can support their families back home mostly in Africa. The other group are families like the Kurdi who may have relatives in countries in Europe or in North America, in this case Canada. Our Canadian Immigration Act is more welcoming or was prior to 2006, since the Harper Regime has made many changes including closing of Immigration Offices in our Embassies abroad, not hiring Officers for many years in a row, creating a staffing crisis where we have insufficient numbers of people able to do the specialized work required in processing refugee claimants abroad and not funding properly the existing program. In Fiscal Year 2014, some 350 million dollars went unspent and was returned to the Treasury, this is unheard of in this time of tight budgets. This was achieve my the Minister refusing to grant authorization to spend budgets despite the need to. With the closing of our Canadian Embassy in Damascus four years ago and at the same time the closing of the largest Immigration program in the Levant, suddenly the much smaller Immigration Offices in Beirut and Amman and the one in Ankara had to take up the work. This created enormous chaos with a war in Afghanistan and Irak, since those Offices already had a full work load for their area, one example Amman in Jordan covers Palestine and Irak, now they would be also responsible for part of the Syrian program and the refugees who are in Jordan while also keeping Irak in the loop. They had to manage without any extra staff meaning that the programs grind to a halt. The Harper Regime is fully aware of the problems in the Middle East and the crisis at hand, however this crisis is being exploited for political ends. We saw it in the case of the Kurdi family drowned at sea. The Prime Minister claims that a war in Syria to eliminate ISIS is the solution to this crisis, what are the civilian population to do, that as he says is not his concern. He also claims that we cannot take refugees from Syria because of security concerns. He mentions the danger of terrorism, of the need to be vigilant, he takes a tone of voice which is paternalistic trying to convince people that he cannot do anything at all. This is all too reminiscent of Europe in the 1930’s and the failed response of Canada then. What has happened here is an abdication of our International Treaty obligations, we are signatory to treaties which requires that we take action. Yes Canada had until 2006 the most generous refugee program per capita in the world. I remember going to International Conferences where other countries would seek our advice on crisis and follow our example. That no longer happens, in fact countries now pretend we are not in the room at such meetings, we have become an embarrassment. Just last week our Finance Minister Joe Oliver was in Turkey and he boasted to the Media in Canada that he was there to tell the Turks how to fix their financial problems, if only they listened to us they would not be in the mess they are now. Such arrogance and all of it to get a few votes from the extreme Right Wing in Canada, Harper’s base. Me, Joe Oliver the White guy speaking to the little people, a tone which is the trademark of the Harper Regime. After the unfortunate events of 22 October 2014 in Ottawa, when a soldier was shot at the National War Memorial by a drunk and mentally ill man, who was quickly deemed a terrorist, our PM has been fanning the flames of intolerance, prejudice, racism and xenophobia under the guise of security. It works because he uses the lowest common denominator and fear is a powerful weapon. Mr Harper has made no secret that he hates Arabs and Muslims, in his speeches he constantly equates Islam with terror. He has made numerous speeches about Islamists and Islamiscist a word he likes to use a lot. Even ordinary citizens have been stressed about the topic to the point many believe that terrorists are everywhere in Canada. The world is a dangerous place says Harper so we must be vigilant. While other countries are developing plans with Germany leading the pack by accepting 800,000 Syrian refugees, we in Canada cannot accept Syrian refugees because they could be terrorists. Mr Harper has promised complex and lengthy security vetting before anyone is accepted. As if we did not have such procedures now and in the past. Anyone who is considered for immigration to Canada or as a refugee is vetted for Health and Security it is standard procedure and has always been thus. Even in emergency cases where lives are at risk, a security assessment is made by the Officer at post. But leave it to Harper to invent new complicated procedures that are needless and unhelpful. His base loves him for it, he is going to save us, they claim, you also hear now from people in his own Caucus how Harper is like Jesus Christ, doing the same work, teaching by example. Oh my, we are ruled by a god, are we far from the North Korean model, I wonder. Today in an open letter a former Prime Minister Jean Chrétien, the one who gave us the Canadian Charter of Rights and Freedom, wrote that Harper had shamed Canada. Yes he has shamed us, we are not the country we were prior to 2006. Harper did say that when he was finished with Canada we would not recognize the country. Well he has succeeded. This debacle with the Refugee Case of the Kurdi family is a clear indication of what is happening. Terry Galvin in an article in the Ottawa Citizen investigated the ministerial paper trail and clearly shows that the Minister of Immigration knew all along about this family and the difficulty they were encountering in trying to claim refugee status. Minister Alexander did nothing, he shamed us. By reading the article I saw what happened and can well imagine how all this could have been avoided, lives saved. What I find especially painful and very difficult to read is the callous and hateful comments of the bigots who loudly support the action of the Harper Regime. They have no shame, they are motivated by the speeches and ideology of Harper and feel justified in expressing their hatred openly. Some go so far as to lift word for word, phrases and expressions from Nazi ideology, advocating shooting them before they get here, mocking the dead for trying to flee and so on, these people vote for Stephen Harper. What has become of Canada? What have we become, a country of nasty little people. When the current situation is compared to Europe prior to the Second World War and what happened to the Jews and many others who did not fit in the Nazi ideology, these same Harper supporters claim that this is not true. Those saying such things attack their leader Harper and are leftist, liberals or terrorists sympathizers and choose many other violent insults to attack and denigrate opponents. I dare to hope that Harper and his people will go away come October 19, that we can reclaim our country from such fanatics and reactionary elements. The Leader of the Green Party Elizabeth May said that she is willing to go to the Governor General if Harper is re-elected and ask that he use his Royal Prerogative so a coalition government could be formed. According to the latest polls, the results will be very tight because 3 parties are splitting the vote. However a coalition could prevent Harper from continuing his misrule. Let’s hope for a better day so that we can reclaim our reputation as a honest broker, peace keeper, an example of stability and social peace in the world. Here are photos of our time in Greece in 2008 just before the crisis hit full force. Cape Sounion which is about 40 minutes by car outside of Athens on the Aegean Sea. The most wonderful spot for me anyways, the sunsets are spectacular. At Cap Sounion, nearing sunset in late afternoon at the Temple of Poseidon. 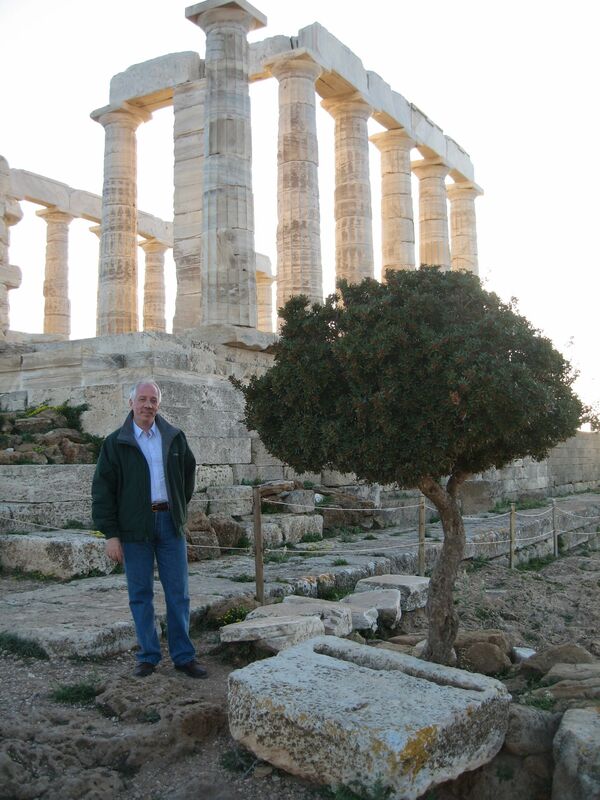 Here I stand near this wonderful Olive Tree, sacred to Poseidon and Athena. 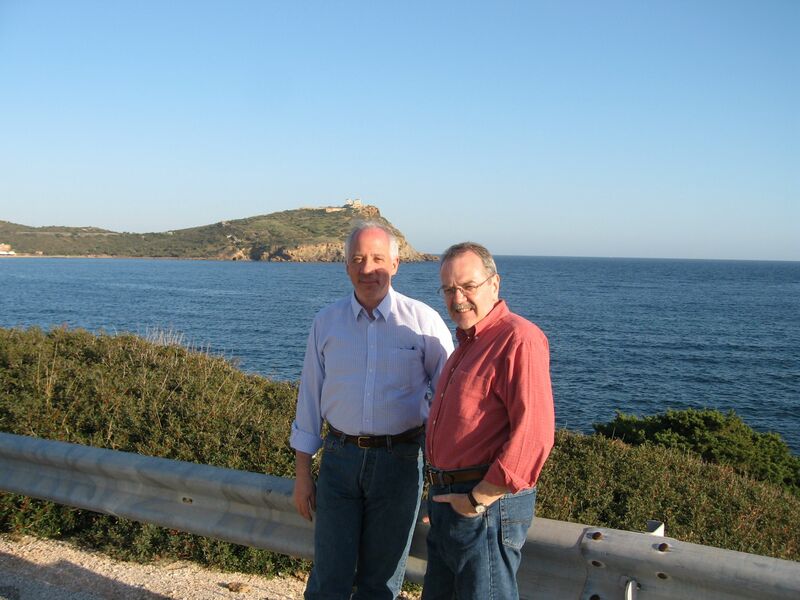 Here we are with Cap Sounion behind us in the distance on the Aegean Sea. We are going to see the Sunset from the Cap. According to Greek Mythology, the Aegean Sea owes its name to the King of Athens, Aegeas. King Minos ‘Minoas’ of Crete in order to punish the Athenians who had killed his son Androgeo, declared war on Athens and won. The Athenians subsequently became subjects of the Minoan Empire. King Minos then demanded that a tribute of honour be paid. At nine year intervals, seven Athenian boys and seven Athenian girls were to be sacrificed. They were to be sent to Crete and devoured by the mythical Minotaur, a monster with the body of a man and the head of a bull, who lived in the Labyrinth. Thiseas, the son of Aegeas and Aithra, decided that he would slaughter the Minotaur and end the shameful bloody sacrifices. He took the place of one of the seven young men and set sail for Crete. Before he left, it was agreed with his father Aegeas that they would hoist black sails as a ‘show’ of mourning, but if they were successful and he slayed the monster, the sailors would hoist white sails on the journey home. Thiseas mission was successful and the Minotaur was killed. Thiseas forgot to raise the white sails as he had promised his father as a sign of victory. Aegeas waited for his son to return. As he stood on the Akrotiri of Sounio, he spied the ship as it rounded the cape – it had black sails. Believing that his son was dead, the king despaired. He jumped off the cliffs into the sea from the temple of Poseidon and killed himself. Lots of tragic stories in Greece, they did give us theatre. The Greek Crisis, what of it? Currently the news pages are full of stories about Greece and the Financial Crisis and its possible default on its enormous debt. It is all very confusing because it is not clear to the average reader how can a country so mismanage its affairs that bankruptcy is the result. I served in Greece for several years and I have read quite a bit about the modern country we know today. Greece was never a rich country to begin with, I am excluding here the period of the City States of Antiquity. During the Ottoman occupation of Greece which lasted for 400 years the country was small population lived on a agricultural and pastoral economy, the Greeks living on the numerous islands faced a subsistence living based on fishing and were mostly isolated during the winter months given the Aegean Sea storms. Lawrence Durrell wrote an excellent book on the Islands of Greece in the 1930’s, it was not the life of today. Given Greece’s economic woes and role as yet another Mediterranean holiday destination, it is hard to appreciate the freedom, sunlight and sense of space that it provided 50 or more years ago. Intrepid travellers would come to explore ruins and ancient villages in solitary peace, and sleep under the stars on empty sandy beaches. 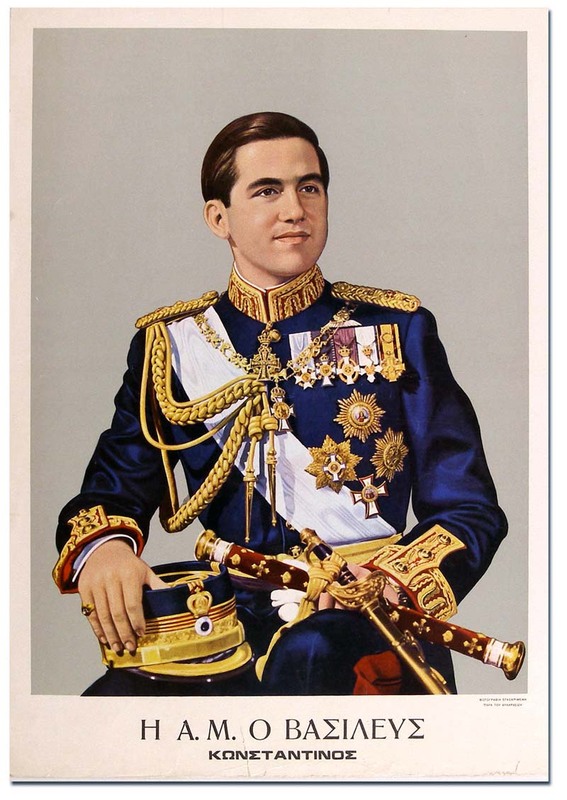 Greece had a Monarchy until April 1967 when a group of Colonels took over in a Coup and sent King Constantine packing. He has been living in exile in Spain, he is related to the King of Spain and to Queen Elizabeth II and Prince Philip. His naiveté and lack of action in the face of military action caused his downfall. The Junta finally fell from power in 1974 after the Cyprus Crisis which saw Turkey occupy half of the Island to this day. A crisis which is still unfolding today and has repercussions in Greece proper. After the fall of the military Junta the subsequent Greek governments did all they could to foster a sense of prosperity and worked at joining the European Union. Something that was not possible during the years of military dictatorship when Greece a member of NATO, was an international pariah. Government spent lavishly on the population and introduced many economic measures which could not be sustained. Greece’s economy is heavily dependent on tourism and tax evasion was and is a national sport with little consequences. Finally Greece joined the EU in 1981 and adopted the Euro as its currency 2001, however it did so by presenting to the European Economic Commission cooked books on its real financial situation. An investigation was opened in 2004 when the true economic picture of Greece became known. The Greek Government had misrepresented the extent of its debts and its lack of hard currency to pay back what it owed. However the true extent of the crisis took hold in 2010. To this day Greece has received 290 Billion Euros in loans to help it get out of this financial crisis it created through years of large deficit spending on a population of 10 million people, most of whom work in government related jobs. 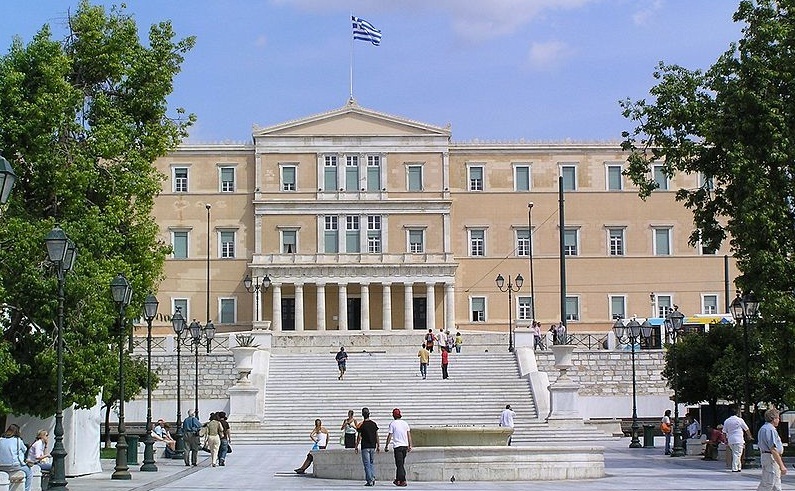 Another scandal was the building of the Megaron in Athens with EU funds. The Greek government had asked for and received generous subsidies to build a Convention Centre however the money was used instead to build a marble Opera palace on a lavish scale. I went to the opera in Athens and was stunned by the luxury of the place. It is this lack of honesty and the widespread corruption within the Greek administration that has the EU up in arms now. The austerity program denounced by the current newly elected left wing government is nothing more than economic reforms which are necessary to avoid more debt. Greece use to give at Christmas time a full 13th month salary to all State employees. A free month pay for no work, just one example of the many extravagances it could not afford. But who was going to complain about free money. Tax evasion remains a large scale problem with little effort to tackle the beast, capital flight another. The EU has run out of patience and it is understandable. Germany has held a firm line like anyone who is afraid that it will never see the money it lent paid back. The canard bandied about in the media that Greece forgave Germany its debts in 1953 and now Germany should do the same, ignores the fact that in 1953 Greece was in turmoil and dealing with the aftermath of a Civil War following the end of WWII. It was in no position as a poor European country whose population largely immigrated to the USA and Canada for work to do any such thing. It was the Marshall Plan and other countries like Canada who came to the rescue of Europe and Greece. The banks and the IMF are not at fault here and suggesting that they are is nonsense and ignores the facts of the case and history. Germany, France, the EU are also not at fault. For the last 5 years they have been asking while lending money to float the Greek boat, economic reforms which have not come. The left wing Syrisa Party now in power made wild promises to the Greek people to get elected, of those promises nothing has come,they wasted opportunities to make economic reforms and now are unable to negotiate a better deal with the EU. Syrisa refused to negotiate knowing this would mean concessions, they promised the Greek people to stand firm, now Prime Minister Alexis Tsipras has painted himself in a corner. His Financial Minister Yanis Varoufakis has been intransigeant and today called the other EU governments ”terrorists” showing a lack of maturity and silly bravado. Greeks are truly caught now in a terrible situation. If Greece is forced out of the European Union it will fall into a third world status amongst the poor countries of Southern Europe. The EU will recover from any exit (Grexit) by Greece, it is the Greeks who have all to loose and then some. Sunday 5 July is the referendum date ordered by Greek PM Tsipras, Greece knows that a NO vote will send them out the door with all the terrible consequences that entails. A YES vote will not be the end of the problems but it will be a clear signal to Europe. This referendum is in fact not so much about the debt and more austerity it is a referendum on PM Alexis Tsipras and his Syrisa government, if the Greeks vote YES it will be a terrible defeat for him and he will be forced out, his government will fall and Greeks will have to return to the Polls to elect a new Government. This is really what it is all about. When is a City a Museum and when is it not. For those of you who read this blog, you will have noticed that I write a lot about the City of Rome. It is the City that was for 1000 years the Capital of the known world. Much more so than Athens which was a City-State but never became the centre of a vast Empire, despite the many gifts Athens gave the world, Democracy, Theatre, Rhetoric, Philosophy, etc… which shaped the development of the Western World. Rome like Sleeping Beauty falls into a 900 year sleep when Emperor Constantine for political and administrative reasons decided to move the Capital to Ravenna and then create a new Capital Constantinople (Istanbul) in 330 AD. Ushering the Middle-Age, a period of illiteracy and superstition, knowledge left the world only to be reborn in 1300 with the Italian Renaissance which brought back Humanist values and a re-birth of the old ideas of Greece and Rome. 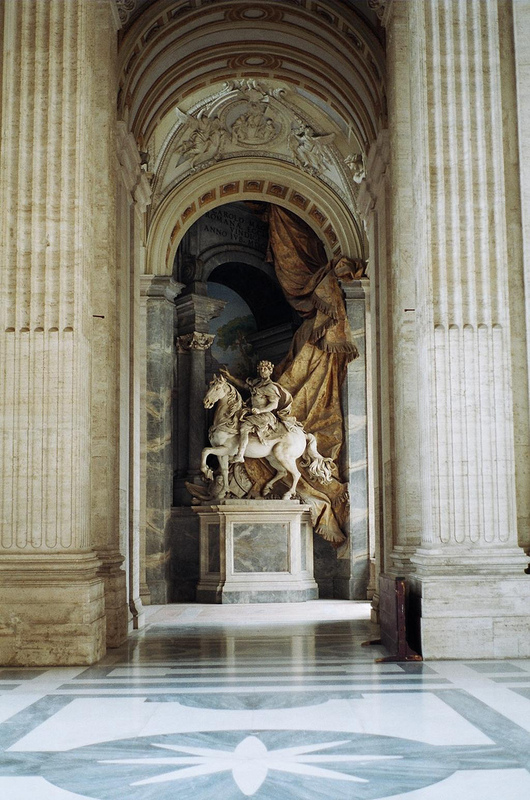 Equestrian statue of Emperor Constantine (272 AD to 337 AD), in the entrance portico of the Cathedral of San John Lateran in Rome. This brings us to Rome today, with all its infrastructure problems and the building of Line C of the Metropolitana, the subway system, 7 years late and 3 billion Euros over budget. Rome is a city of 3 million people in a small dense area, crammed with cultural and artistic treasures everywhere you look. Rome today was re-built largely at the time of the late Renaissance (1490-1560) and the age of the Baroque (1600-1720) re-modelling buildings of antiquity and late Middle-Age. The next big construction spurt came between 1860 and 1938. Rome being what it is suffers from procrastination, City Officials, the political class, Academics, Archeologists, Historians and everyone in between has an opinion as to what to do in terms of development but decisions are slow to come and never quite final. So since 1960 it has been far easier to develop the outlying areas some 20 Km from the centre than the centre itself. The only man who dared demolish on a grand scale the centre of the City to open it up to new development was Benito Mussolini who has dictator in 20 years in power did develop the infrastructure of the City without taking into account what others had to say. Everyone including the tourists benefitted from these great civic works. What you see today in the Forum area is his doing, around the Vatican, and the new neighbourhoods outside the Aurelian Walls and EUR including the metro system all his doing. But this was achieved only through the demolition of entire neighbourhoods and created employment for thousands of men at the time of the great depression. 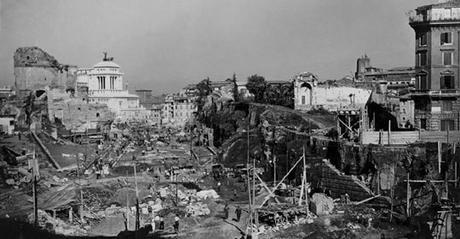 Demolition of neighbourhoods to create Via dell’Impero known today as Via dei Fori Imperiali. 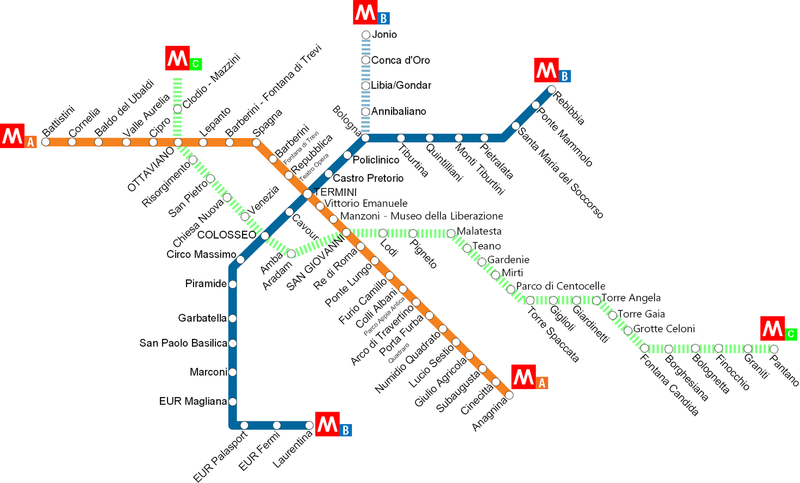 Presently Line C of the Metro is crawling towards its connection with San Giovanni Laterano on Line A. Last year 12 stations opened all at once from Pantano to Parco di Centocelle, this year the line is extended from Mirti to Lodi. The Station at Lodi is 1 Km from San Giovanni. Next year it will finally be connected to Line A of the Metro system. This new line has been in construction for 15 years. Now for the difficult part and the fight with historians, archeologists, tree lovers and Romans who have an opinion on the matter, well they all do. The next phase will see Line C go towards the historical section of the Roman Forum and Piazza Venezia and then down Corso Vittorio Emanuelle towards the river Tiber and the Vatican on the other side. 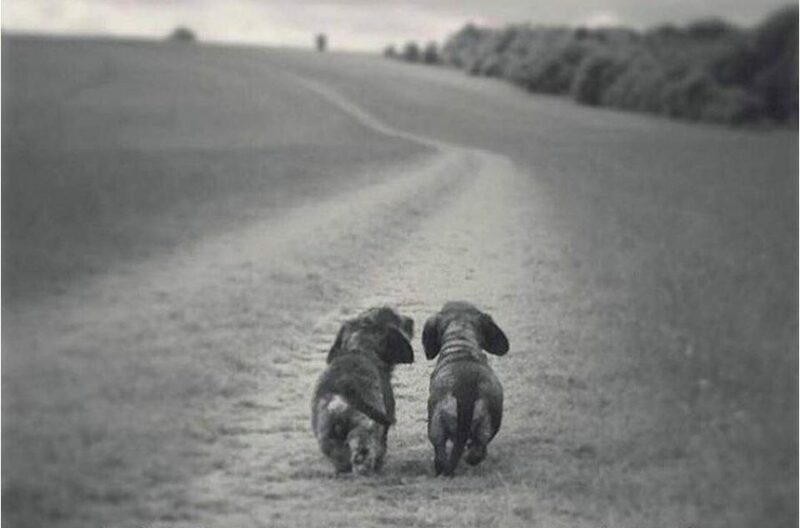 You could walk the distance in about 40 minutes. The metro tunnels are some 60 meters underground, one would think it’s deep enough to avoid any artifacts from Antiquity. Not so. In 2008, 2009 at Piazza Venezia which is the centre of Rome, archeologists preparing the ground for the arrival of the metro tunnel discovered the long forgotten or lost Academy of Emperor Hadrian and another building connected to the Forum of Emperor Trajan next to it. Both buildings where just a few meters below the street surface and all that is left are brick walls and the inlaid coloured marble floors. Well this discovery stopped all work on the metro line for 4 years. Then discussion papers were presented and long meetings and conferences held with a host of archeologists, historians and all kinds of experts on antiquity, what to do, some proposed to cancel the metro stop all together at Piazza Venezia. Others pointed out that Mussolini had a Metro station built at the Colosseum, yes but he was a dictator. Others also pointed out that the tunnels are so deep they cannot come in contact with the two buildings at Piazza Venezia. Yes but those buildings are important witness of the past and should not be disturbed though they are now reburied under the street. Does this make any sense? Is it practical to think thus? Cost overruns and delays should trump such concerns given that all the necessary research work has been done. So here you have it the eternal question for the Eternal City, Is Rome a city for the living or is Rome a vast Museum to the glory of the Imperial past. If you are wondering the tunnel work has resume on the section between San Giovanni and Colosseo and Piazza Venezia. Each day the blog publishes photos of the progress of the work along Via Fori Imperiali and along the ruins of the Temple of Venus and Rome to the great disapproval of the experts. But the discussions and gnashing of teeth goes on and on and on. In the end I predict that the metro line will be opened and work completed despite it all. Italians are very attached to the past but in the end things do get done. My friend, Yannis B. who is a chef in Greece posted this on his FB, it is Akis Petretzikis a young chef and I like his recipe for Moussaka, the big difference is that instead of frying the vegetables he oven bake them, much healthier. Just watch this video on how to make Moussaka and how to pronounce the word Moussaka. This photo is one of my favourite, the Sacred grove surrounding the Acropolis of Athens. Visible the Parthenon which is still under renovation after 25 years and millions of Euros. If you wonder about the white and dark gold colour of the temple this is the repair work, new Pentelic marble is white and turn a dull golden colour with age. The work aims to stabilize this 2500 year old Temple to Athena. It is a spectacular temple and you can see what Athenians paid for after Pericles convinced them to give freely to finance this monument to the Goddess protecting their City. He told them that it was their duty as Citizens of Athens to do their duty and finance this project. An ancient concept that it is your Duty to do whatever you can for your country. Also visible is the Erechtheion and the entrance gate Propylaea. The neighbourhood below the hill is the Plaka, one of the oldest neighbourhood of Athens. In the distance the Aegean Sea and the Port of Piraeus, quite the dramatic view of the City.